Which Bell Color Is The Healthiest? 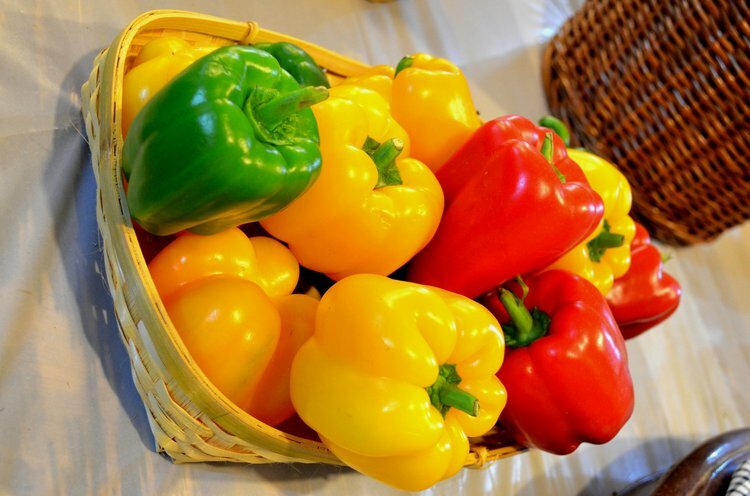 Bell peppers come in different colors including red, yellow, green, chocolate, white, and purple. They are low in calories and rich in vitamin C and other antioxidants, making them an excellent addition to a healthy diet. The bell pepper, also known as a sweet pepper or capsicum, is a type of pepper of the species Capsicum annuum. The plant varieties come in different colors including red, yellow, green, chocolate, white, and purple. Of all the pepper varieties, bell peppers are the least pungent since they do not contain capsaicin, the chemical that causes an intense burning sensation. Usually, unripe bell peppers are either green, pale yellow, or purple. Red bell peppers are simply ripened green peppers. Green peppers are least sweet of the lot and slightly bitterer than yellow or orange peppers; red bell peppers are the sweetest. Each bell pepper type contains nearly similar nutrition qualities; however, they do differ in their quantities of vitamin C. For example, yellow is in between ripeness of the green and red variety but contains the most vitamin C per 100 grams. The same quantity of yellow peppers contains 306% of the daily recommendation of vitamin C, whereas the red pepper comes in second with 213%. Lastly, the green pepper contains 134% of the daily vitamin C recommendation. Vitamin C is advantageous for the body for many reasons. An adequate intake of vitamin C can help the body create and maintain collagen, an essential protein found in hair and skin. Collagen is very important because it holds the skin, tendons, and ligaments together. Also, vitamin C is a potent natural water-soluble antioxidant, which helps the body develop resistance to infectious compounds. The vibrant red bell pepper contains the most vitamin A with 63% of the daily recommendation, followed by the green bell pepper with 7%; the yellow bell pepper contains about 4%. Vitamin A, along with other antioxidant compounds, can help protect the retina (the inner layer of the eye that is sensitive to light) from damage caused by blue light. Antioxidants are natural substances that may delay or prevent cell damage. For extra brain power, individuals should try red bell peppers. They contain more folate and potassium than the other types. Folate has been known to reduce the rate of Alzheimer’s disease and cognitive decline. Potassium has been associated with an increase in blood flow to the brain, and enhancement of thinking ability, concentration, and brain activity. Potassium has the capacity to relax the blood vessels, allowing more blood and nutrients to flow to the vital brain areas. Depending on what the culinary requirement is, red and yellow peppers appear to be the best choices for nutritional reasons. Red bell peppers contain almost the same amount of vitamins and minerals as the other varieties; nevertheless, they contain much more vitamin A, potassium, and folate to help protect one’s nerves, brain, and heart. Podmore, I. D., Griffiths, H. R., Herbert, K. E., Mistry, N., Mistry, P., & Lunec, J. (1998). Vitamin C exhibits pro-oxidant properties. Nature, 392(6676), 559-559. Kalt, W., Forney, C. F., Martin, A., & Prior, R. L. (1999). Antioxidant capacity, vitamin C, phenolics, and anthocyanins after fresh storage of small fruits.Journal of Agricultural and Food Chemistry, 47(11), 4638-4644. He, F. J., & MacGregor, G. A. (2008). Beneficial effects of potassium on human health. Physiologia Plantarum, 133(4), 725-735. Ryan-Harshman, M., & Aldoori, W. (2005). Health benefits of selected vitamins.Canadian family physician, 51(7), 965. Peña, A. S., Maftei, O., Dowling, K., Gent, R., Wiltshire, E., MacKenzie, K., & Couper, J. (2013). Folate fortification and supplementation do not provide vascular health benefits in type 1 diabetes. The Journal of pediatrics, 163(1), 255-260. Yahia, E. M., Contreras-Padilla, M., & Gonzalez-Aguilar, G. (2001). Ascorbic acid content in relation to ascorbic acid oxidase activity and polyamine content in tomato and bell pepper fruits during development, maturation and senescence. LWT-Food Science and Technology, 34(7), 452-457. Frank, C. A., Nelson, R. G., Simonne, E. H., Behe, B. K., & Simonne, A. H. (2001). Consumer preferences for color, price, and vitamin C content of bell peppers. HortScience, 36(4), 795-800. Ghasemnezhad, M., Sherafati, M., & Payvast, G. A. (2011). Variation in phenolic compounds, ascorbic acid and antioxidant activity of five coloured bell pepper (Capsicum annum) fruits at two different harvest times. Journal of functional foods, 3(1), 44-49. Sun, T., Xu, Z., Wu, C. T., Janes, M., Prinyawiwatkul, W., & No, H. K. (2007). Antioxidant activities of different colored sweet bell peppers (Capsicum annuum L.). Journal of Food Science, 72(2), S98-S102. Wahyuni, Y., Ballester, A. R., Sudarmonowati, E., Bino, R. J., & Bovy, A. G. (2011). Metabolite biodiversity in pepper (Capsicum) fruits of thirty-two diverse accessions: variation in health-related compounds and implications for breeding. Phytochemistry, 72(11), 1358-1370. Fox, A. J., Del Pozo-Insfran, D., Lee, J. H., Sargent, S. A., & Talcott, S. T. (2005). Ripening-induced chemical and antioxidant changes in bell peppers as affected by harvest maturity and postharvest ethylene exposure.HortScience, 40(3), 732-736.